The Committee for Ballarat has an excellent campaign going to improve rail services. Unfortunately as sometimes happens, some myths crept into the rhetoric around the launch of the campaign. It’s tempting to automatically assume things are crap now, and were better back in the “good old days“. But this is entirely wrong. We know this because Mark Bau’s excellent web site of old timetables includes a timetable from 1905. This shows, for instance, a stopping train departing Spencer Street at 7:40am, arriving at Ballarat at 11:08am — a trip of some 3 hours and 28 minutes. An express train (stopping only at Melton, Bacchus Marsh, Ballan, and Ballarat East (quite similar to many express services today) departed at 4:40 and arrived at Ballarat at 7:25, for a travel time of 2 hours and 45 minutes. Nowadays a typical train stopping along the way might be the 9:07am, arriving Ballarat 10:33 (1 hour and 26 minutes), whereas one of the fastest appears to be the 4:36pm express train, arriving at 5:41pm, or 1 hour and 5 minutes. Of course, this doesn’t invalidate the aims of the Committee’s Fast Track campaign, which aims for more frequent trains, more reliable services, faster travel times and better mobile phone coverage along the route. One of the persistent myths is that in the “good old days”, before trains and trams had locked doors, nobody ever fell out. When the old VR ran the suburban network trains, and stations were manned and had barrier gates, trains had a lot of doors and it was never a problem. Nobody fell out either, people were RESPONSIBLE for their actions way back then. A search of the National Library’s “Trove” archive of newspapers for train fell out finds scores of cases from around Australia, some fatal, some causing only minor injuries, some adults, some little kids. 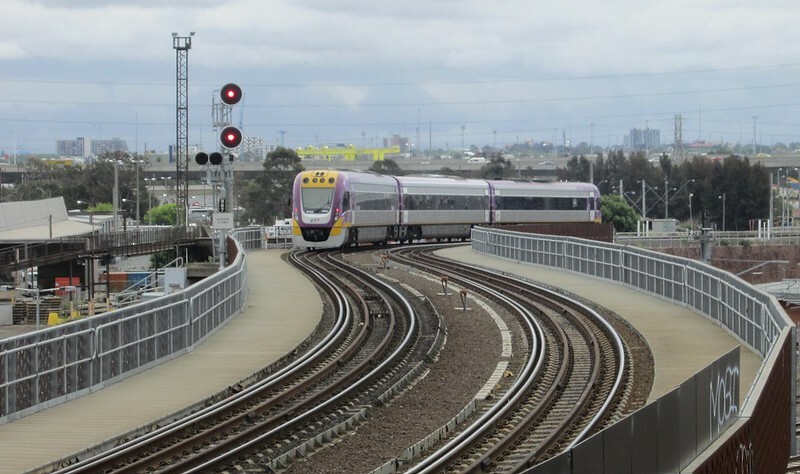 Thomas M. Hassett, aged 51 years, of Holt street, Richmond, fell out of a train near Werribee on Saturday morning, while leaning out of a door. The train was immediately stopped, and the train crew ran back to where Hassett was lying on the side of the line. He was placed on the train and taken to the Spencer street station. An ambulance then transferred him to the Melbourne Hospital, where he was admitted with concussion and several broken ribs. A search for tram fell out also finds many cases. The Brisbane tramway museum has a page about fatal tram accidents; they found a register of what appears to be all of them from Brisbane’s tramway history, from 1897 to 1969 (a few years after trams had been converted to buses). Their attempted categorisation of the data (it’s not easy to do apparently) concluded that amongst 509 deaths over 70-odd years, 64 were due to “Falls from moving trams”, 59 were from “Alighting from moving trams”, and 25 “Boarding moving trams”. Many of us fondly remember summer days, riding in trams and trains with the doors and windows open, the cool air blowing through. Many of us fondly remember stepping out onto the running board of trams, jumping off before the tram had come to a stop. Sure, there’s nostalgia. But the reality is there were accidents, people were injured or killed, and the quest for better safety is a worthy one. Although there have been many convictions for rowdy conduct in the trains to Frankston at weekends, offences of this kind constantly occur. At the Malvern Court on Monday, before Mr. Cohen, P.M. and Messrs. Patterson, Hattam, and Carroll, J.P.’s, the Railway Department proceeded against Bernand Molloy, 214 George street, Fitzroy, and George Spence, 399 Drummond street, Carlton, on a charge of having interfered with the comfort of other passsengers in the half past 7 down train to Frankston on December 30. Inspector P. Roy represented the department, but the defendants did not appear. The evidence of Detective O’sullivan, who was in company with Detective Wilson on the occasion, showed that three men, including the two defendants, entered a first class compartment at Flinders street. They had bottles of beer with them. Molloy, sat with his legs dangling out of the Tait carriage, and was guilty of indecent conduct. The three were jostling and pulling one another about, and used filthy language. There were several passengers, including ladies, in the carriage. One of the men jumped from the train into the pit at Malvern and escaped; the others were taken out at Caulfield, and gave wrong names and addresses. Mr. Cohen said that this sort of thing was becoming very frequent, and he was glad that the department was taking action. He travelled on that line, and there never seemed to be any officers about. Defendants would be fined £10 each, with 5/ costs. — The Argus, Tuesday 6 February 1917. That was ninety years ago. So a lack of consideration for fellow passengers from some has always been a problem. Witness the two young males with their feet on the seats all the way from Bentleigh to Parliament on Monday morning. One apparently fast asleep and possibly oblivious to the fact that the carriage filled to the brim, the other trying to look like he was asleep, but not actually in the land of nod. I’m hoping they got a little surprise at Parliament, as a group of inspectors got on further down the carriage, and were encouraged by a passenger (grin) to go give these blokes a wake-up call. 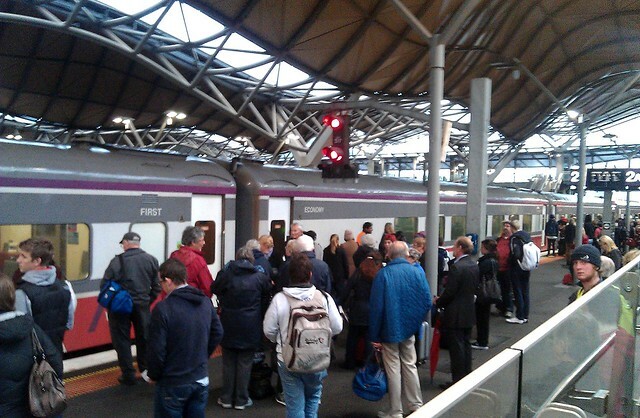 On Tuesday the Frankston line was suffering from signalling faults. Track 3 was out of action, so trains from the city went onto track 2, with trains to the city (both express and stoppers) squeezing onto track 1. The result was predictable overcrowding, and though my trip was made in good time, it was uncomfortable, and at some of the MATHS stations, people couldn’t squeeze on. I could hear a couple of people getting cranky when (a) asking people to move down into the carriage (that was the first thing I’d done when I boarded) and (b) trying to get out and having another person closer to the door refuse to momentarily step out to let them through. You’d always hope people would be more considerate of others. Sadly it’s not always the case.